by Abbigail Hull, Hunger Advocacy Fellow-Washington, D.C. This was the ambitious commitment in the creation of the United Nations Sustainable Development Goals (SDGs). The SDGs are a set of universal goals “unique in that they cover issues that affect us all. They reaffirm our international commitment to end poverty, permanently, everywhere. They are ambitious in making sure no one is left behind” (undp.org background). These 17 goals, such as zero hunger, are for striving toward by developed and developing countries. This call is not just a United Nations commitment, but a biblical call for us as Christians. We leave no one behind not only because it is good for the economy, or the planet, or the “right thing to do,” but because Jesus Christ, our example, time and time again focused his love and attention on those who were forced into the margins. He cared for the people that the Pharisees and others in power had left behind, including the poor, the diseased, the widow and the prostitute. 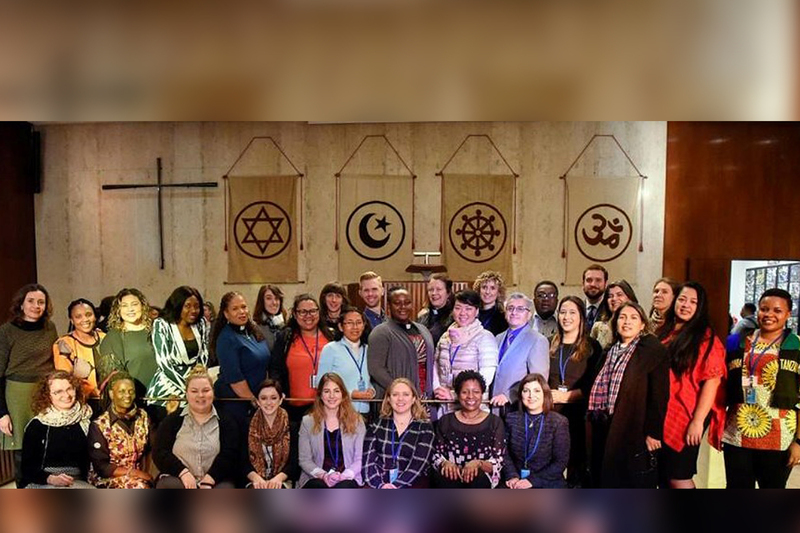 I was a part of a Lutheran delegation during this year’s United Nations Commission on the Status of Women (CSW63) held in March. The Lutheran delegation hosted worship on the event’s opening day. The Gospel chosen was Matthew 20:1-16, where Jesus reminds His disciplines in a parable: “So the last will be first, and the first will be last.” Leave no one behind by making our most vulnerable siblings first. For those in power, who have always been first, this can be uncomfortable. As Christians, we are called to be examples of this radical love of leaving no one behind. So, how do we do this? The theme of this year’s CSW63 was: “Social protection systems, access to public services and sustainable infrastructure for gender equality and the empowerment of women and girls.” When Lopa Banerjee, Director of the Civil Society Division for UN Women, addressed the Ecumenical Women at the United Nations, which the Lutheran delegation was a part of, she simply put that social protection systems such as pensions and food programs are “leaving no one behind in manifestation.” Social protections systems can manifest the biblical call to leave no one behind by putting those who are normally last, first. Mikka McCracken, Director of Planning and Engagement for ELCA World Hunger, presented at CSW63. She put another powerful spin to the statement: “leave no one behind.” She reminded the audience that everyone, and every institution, has a role to play in de-marginalizing those in the margins, especially the Church. The ELCA and the wider Christian community need to continue to take their seat at places such as the United Nations. Not only do we have the theological tools available and necessary to inspire communities to tackle these lofty SDGs, but also the Church has been providing social protection services and caring for the marginalized from the very beginning. And that is why as a church we not only say “leave no one behind,” but we continue to act on it.